Since stepping in as chairman of Repsol YPF in 2004, Antonio Brufau Niubó has masterminded a string of changes to modernise the company, which is one of the 10 largest private oil companies in the world. The 63-year old has been credited with turning around Repsol’s fortunes by reducing its debt and employing new technology to uncover reserves in the Atlantic Ocean off Brazil. Further discoveries in spots such as Morocco and Sierra Leone saw the company sail through the recession and emerge on the other side a winner – all courtesy of the crafty CEO and his special ways. In recent times, one of the most important agreements to be reached is the commitment to invest in Bolivia. Repsol’s investment plan in the country amounts to $640m for the 2010-2014 period. “It is the most important investment underway in this sector in Bolivia,” asserted Evo Morales, the country’s President, as he shook hands with the Repsol boss. The first phase of the development plan for the so-called Caipipendi project will see production capacity triple in 2012, as compared to the three million cubic metres of gas produced daily at the moment. The second phase, meanwhile, will increase the daily output to 14 million cubic metres of production from 2014 and onwards. A man of extensive experience, Brufau Niubó has cut his teeth in senior positions at a number of organisations. Upon graduating from the economics programme of University of Barcelona, Brufau went on to take a position at Arthur Andersen, where he was nominated Partner and serves as director of auditing. Next, in 1988, the ambitious Spaniard joined the major bank la Caixa as deputy managing director. Advancing steadily within the group, he served as managing director from 1999 to 2004. With fingers in many pies, Brufau serves not only as the CEO and chairman of Spain’s biggest oil company, he is also the Vice-Chairman of Gas Natural Fenosa. Notably, he was the only Spanish member in the Executive Committee of the International Chamber of Commerce (ICC) until December 2005. 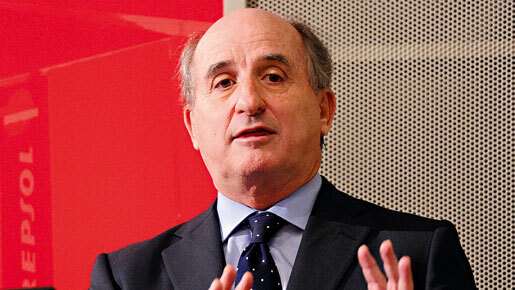 In July 2002, he was appointed President of Circulo de Economía de Barcelona, a position that he held until July 2005. Having been bestowed a number of accolades, Brufau was granted the 2010 Entrepreneur of the Year award by the Federation of Spanish Chambers of Commerce in Europe (FEDECOM) in recognition of his stewardship of Repsol’s increasing activity outside the home-turf. Its strong presence in the OECD countries – which features heavily in the company’s strategic plan for the future – has been particularly congratulated. Currently, Repsol operates across more than 30 countries on five continents and of the 40,000 strong workforce employed by Repsol, more than half work outside Spain. “The internationalisation of Repsol is a result of the talent and effort of a team of people made up of more than 70 nationalities from all over the world, whom I am honoured to represent,” said Brufau cheerily when receiving the award. Another professional characteristic that no doubt helped convince the jury that Burfau was the man most deserving of the award is his unwillingness to be stuck in old ways. Burfau is determined to re-evaluate the business structure of the group at regular intervals. One of his latest drives in relation to working method is to tap into the teleworking trend, which is sweeping the globe but has so far not entered Spain with any major force. To spearhead the environmentally friendly and time-efficient style of working, Repsol has launched a programme in which 600 employees are invited to work partially from the comfort of their private residences, while serving the rest of their working week in the office. “The results of surveys involving workers and managers show that the formula works and that, with existing technologies, the balance between work and personal life has found a good ally,” reads a Repsol company statement in support of the scheme. Flaunting good corporate citizenship under Brufau’s leadership, the company has taken on the challenge to extend its job availability for disabled individuals across all its facilities. Repsol’s offices and services stations were the first sites to benefit from the scheme, and the programme will progressively be rolled out to include the Puertollano Industrial Complex; thereafter it will be implemented across all the company’s industrial facilities, with the aim to offer employment to 10 percent of individuals with different forms of disabilities by 2015. The planned transition displays the company’s strong ethics, but it will involve a string of measures to ensure that the premises’ standards are disability-friendly, while safety aspects in place have to be re-addressed. In view of Brufau’s many good deeds, he is a rather popular man. But his time at the head of Spain’s biggest oil company is not entirely free of challenges. Last year, a dispute arose between himself and two of Repsol’s major shareholders, Petroleos Mexicanos and Sacyr Vallehermoso SA. The two companies joined forces to gain a majority to push for Repsol to kick Brufau off the throne and appoint a new CEO who would ensure improved management, and push strategies to boost earnings as well as share price and dividend payments. Fighting his corner with gusto, Brufau has commenced proceedings by having the two investors’ representatives removed from Repsol’s board.